Haseko Corporation has made it a basic policy of its corporate management to contribute to society and win society’s confidence through its business operations that put customers first. The Company has also positioned reinforcement of corporate governance as one of its utmost management priorities as it recognizes that it is indispensable to secure management transparency and objectivity for maximizing corporate value in a stable manner over the long term and ensuring shareholders’ interests. The Board of Directors of Haseko Corporation serves as the institution where directors with expert knowledge and experience in various business sectors conduct decision-making on managerial issues and supervise execution of duties of other directors. As for monitoring of management operations, the Company’s system provides the Board of Auditors, the majority of which are outside auditors, with the monitoring function from an objective and neutral standpoint from outside through implementation of audits. On top of these functions, starting in June 2016, Haseko appointed outside directors with abundant experience and track record to occupy at least one third of the Board of Directors, so that they shall provide appropriate opinions and advice in order to further activate discussions at the Board of Directors as well as enhance the function to monitor business management. Going forward, we will continue to look for a system that is optimum for the Company, taking into consideration the balance between the operation of the Board of Directors and the monitoring functions. With the recognition that intensive compliance is indispensable for the existence and continuity of a corporation, the Company established the Haseko Group Standards of Conduct in April 2003, under which Haseko has been working to establish a management system where all directors, operating officers and staff respect societal standards and take sensible courses of action in keeping with their duties as members of society, as well as complying with all laws and the Company’s articles of incorporation, so that the Company can win the confidence of society. Moreover, for enhanced compliance Haseko established the Compliance Department which conducts promotion and education of compliance based on the internal rules and regulations on compliance. An internal whistle-blowing system for consultations on compliance and notification of illegal conduct, etc. and an external contact have also been established. In April 2005, the Company established the Internal Auditing Department that is under the direct control of the President. Pursuant to internal rules and regulations on internal audits, the Department investigates and evaluates whether activities of respective divisions conform to laws and regulations, the Articles of Incorporation, the Company’s rules and regulations, corporate policies, etc. and whether they are reasonable, and works to make improvements based on the results. The Company has no relations with anti-social forces or groups that threaten the order and security of civic life, and will cope with such anti-social forces and groups systematically, and with an adamant and resolute attitude. In anticipation of a variety of risks, Haseko endeavors to collect risk-related information and prepares preventive measures and appropriate countermeasures in advance against risks according to their magnitude and possibility of arising. Through these efforts, Haseko aims to minimize the potential losses and to systematically cope with risk management centering on the Risk Management Department established in April 2006. Specifically, Haseko has set up a system in which respective sections of the Management Division coordinate with each other and check the status of business operations in accordance with the roles they are assigned, while the Internal Auditing Department conducts further checking. For the corporate approval system that serves as a record of decision-making for work implementation, the Company has introduced an electronic system in which legal procedures have been digitized. This system enables auditors and the Management Division to view and check the content at any time. 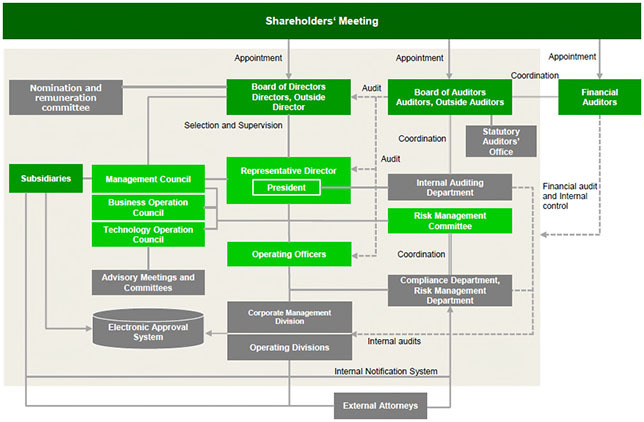 Furthermore, of the issues forwarded to the Board of Directors and the two operation councils (the Business Operation Council and Technology Operation Council), those involving many departments or requiring specialized knowledge are subject to sufficient verification in advance by the adequately established advisory meetings and committees. Periodical results reports are also mandatory for issues that require monitoring. On top of these, the Company established the Risk Management Council under the chairmanship of the President, in May 2006 with the aim of strengthening the risk management system of Haseko and its entire Group. This enhanced the Company’s risk management system in which cross-sectional collection of information, analysis, valuation and handling of risks are conducted in accordance with the internal rules on risk management.